The storyboard will now show all views in the correct size. This entry was posted in Code Snippets and tagged iOS, Storyboard, XCode on July 5, 2013 by admin. This entry was posted in Code Snippets and tagged iOS, Prefix.pch, Rename Project on July 1, 2013 by admin. Select the scheme you want to change, and hit Return. Now the scheme name will be editable, and you can change it to your hearts desire. Then hit Return again to save it. 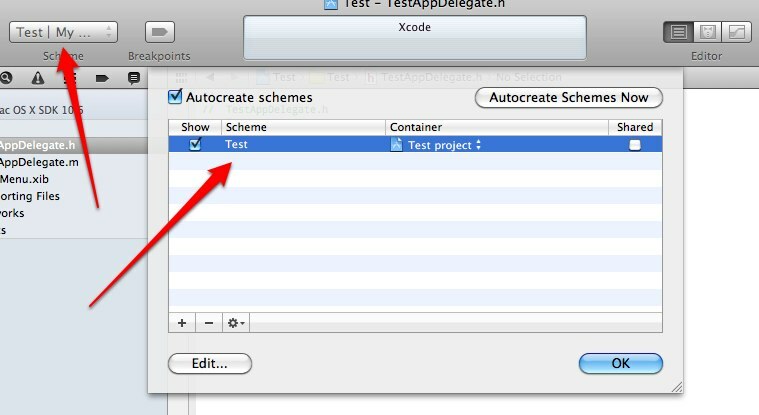 This entry was posted in Code Snippets and tagged iOS, Rename Project, Scheme, XCode on June 30, 2013 by admin. [[UIAlertView alloc] initWithTitle: @"Here is my alert title." message: @"Here is my alert message." This entry was posted in Code Snippets and tagged iOS, UIAlertView on June 29, 2013 by admin. UIImage will determine the right one to use. If using Interface Builder, point to the image.png and not the @2x image. This entry was posted in Code Snippets and tagged iOS, UIBarButtonItem, UIToolbar on June 26, 2013 by admin. This entry was posted in Code Snippets and tagged iOS, UIActivityIndicatorView, UINavigationBar on June 25, 2013 by admin.